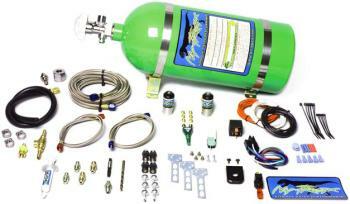 Ny-Trex Nitrous System - Wet - Dezod Motorsports Inc - Home of the automotive performance enthusiast since 2002. 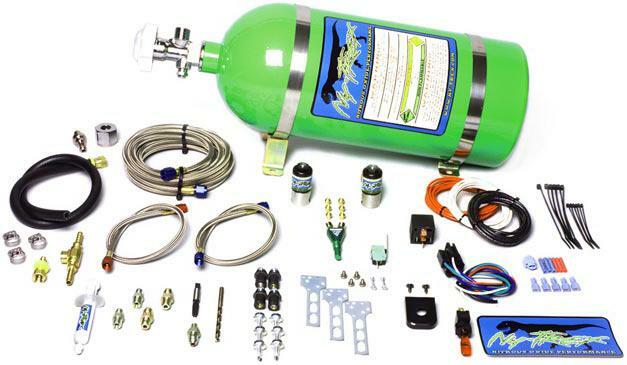 Ny-Trex nitrous systems use only the highest quality materials and components to produce the best looking, best performing and most reliable wet system around. Ny-Trex systems have been thoroughly dyno-tested on numerous vehicles to ensure the most safe and reliable performance possible. Exclusive T-Rex Nozzle with true blend spray bowl delivers a swirl cone plume at 70? angle to center the throttle body for an even blend. Flows up to 300+HP yet works great delivering only 35HP. Chrome Plated 660 Hi-Flo bottle valve with integrated gauge port always reads bottle pressure. Solenoid valves are made with Volt-Trap coils for stronger, more efficient power, allows for larger orifice, more flow and works with as few as 9 volts. Plungers are made of high grade stainless with greater tolerances to prevent sticking. The N2O seal is Teflon and a special Viton seal is used for fuel. Dual Taper Jets provide a consistent flow of nitrous and fuel and come in a large array of sizes. Easy install components such as well nuts to install bottle topside, drill bit and tap for fuel connection, Teflon sealant and easy install Quick-Guide.